It is not possible to count the bees in my room, I am sure there are at least 20 of them here in the Siaya Centre Hotel with me. I am lying under the net typing on my computer, maybe I goofed up, I have been living in this Hotel now for about four nights. I have visited every Hotel in the city and it is the most expensive at 850 Shilling per night, I know I am not being cheap. 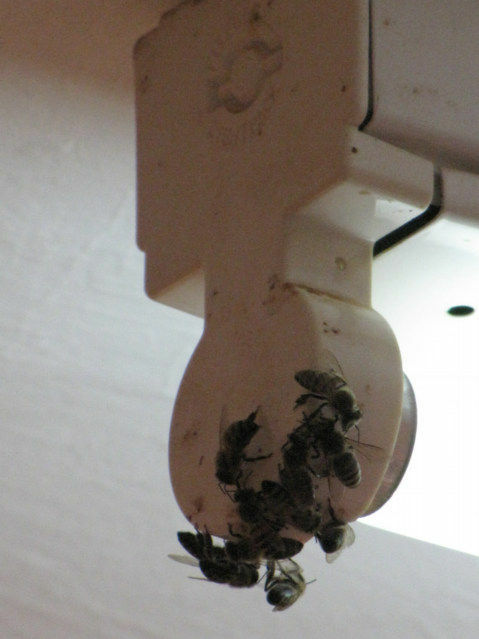 Bees sitting on each end of a fluorescent light fixture, they never left even when the sun came up, maybe if I shut the light off they would leave, however who wants 20 Bees flying around in a Hotel room? For the first two nights I kept the door and windows tightly closed from about five in the afternoon until the sun rose in the morning. This was a good strategy, except the room was stuffy and hot, and this annoyed me. I knew the outside air was fresh and cool, the room was only the retaining the heat because of the concrete building. I know if I opened the windows and balcony door, my room would be cool and fresh; I would only have to deal with the increase in noise. I was safe and comfortable under this net when 20 Bees or more invaded my room in the early morning hours. When I turned on the light they all came and huddled up around the one end of the fluorescent ceiling light. There is a racket a small thunder when 20 Bees are in your room, it is an uncomfortable roar. I am not allergic to Bees, however I see no reason to come out from under my mosquito nets until the sun is raised and the heat of the day hopefully has lured them away. The bees seem cold, they truly are searching for heat, I turned on the small light bulb next to my bed which is warmer than a fluorescent light; however I quickly turned it off and decided to use the overhead fluorescent light. There is something unnerving about having Bees buzzing next to your head. 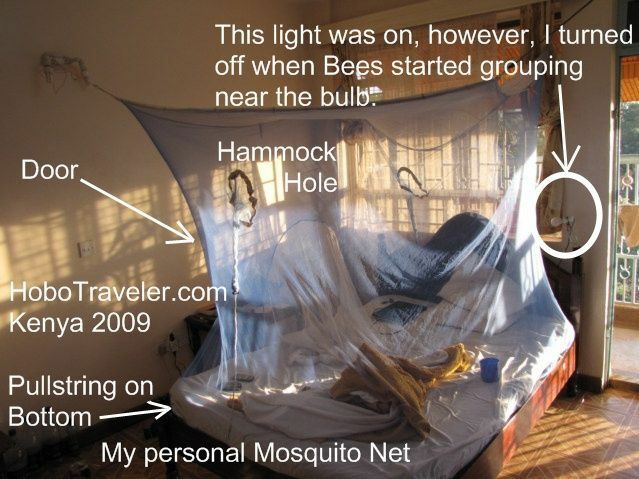 I am quite safe inside my mosquito net and truly grateful I did not use the Hotel Mosquito Net. 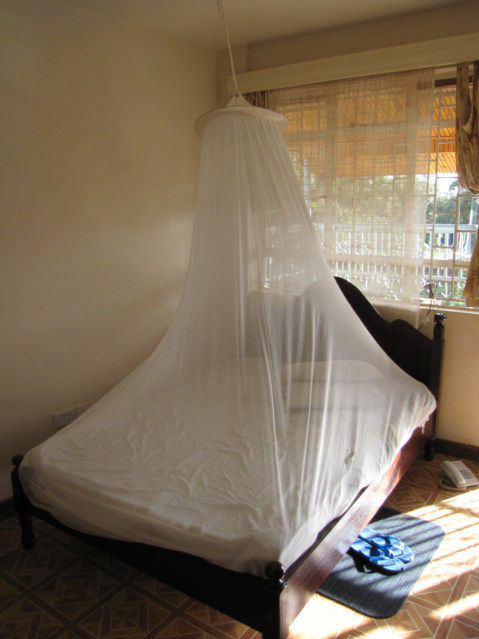 This is the easy to hang Hotel Mosquito Net, it the standard net provided in Kenya Hotels and truly a waste of energy, I keep trying to figure out a way to make it functional, however, this type of Mosquito Net is worthless. The goal of a Mosquito Net is to stop mosquitoes; I believe the goal should be to stop 100 percent of the Mosquitoes with no exceptions. 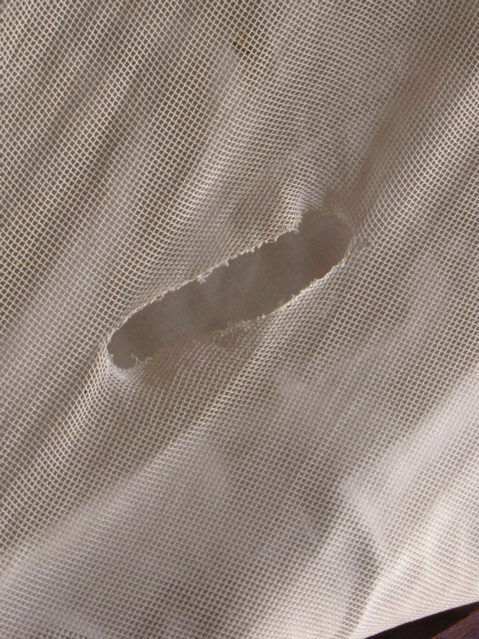 People tuck the Mosquito Net under the mattress, then are not careful when they remove and it tears the net. (I think Ash recommends you carry Duct Tape so you can patch holes in a mosquito net.) This particular net had many holes, there is no way it would stop the Bees or the Mosquitoes. If a mosquito net is touching your skin, the mosquitoes can bite you through the net; it cannot be close to your skin. Every edge of this Mosquito net is leaning in towards the bed, this creates a sleeping area about the size of a four foot human and this is a double bed, not a single bed, this type of net is more of an annoyance than a solution. I am always thinking about the people living in Africa or any region of the world where there are Mosquitoes. Somehow, the human mind has an ability to accept situations it does not know how to change. Most Tourist and Travelers keep upgrading Hotels until they finally pay hundreds of dollars for a room that provides screens on the windows. This design is the trend in Mosquito Nets, a freestanding tent that people place on top of their beds. Make sure you get one with a bottom in it; I sleep on many single beds, anything bigger than a single is going to be a problem. 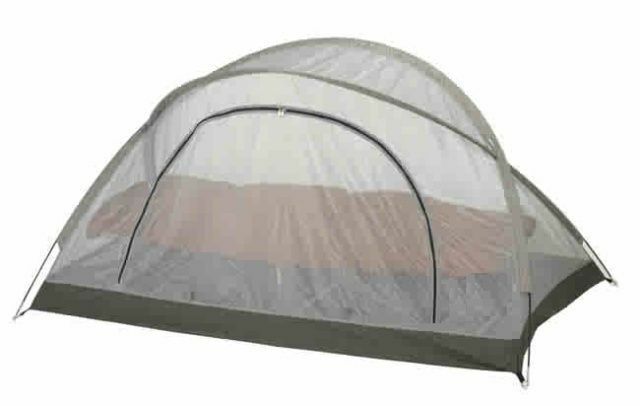 I am not carrying this type of Mosquito Net because I have yet to solve the pole problem; this is a lot of weight and does not work in the jungle when a person must sleep in a hammock because the ground is wet. Yes, I always carry a small amount of duct tape (normally about 5 meters taken off the original reel and wrapped around something flat like a strip of card to save space). Ive used this to mend my mozzie net and also one of those little duffle bags. I learned the other day that mosquitos are NOT ATTRACTED TO LED light. I think this is a very useful piece of information, and if it is true (I have tried to verify, there are very few sources on google, but most point to it being true) I do not know why the NGOs are not replacing the lightbulbs of the world. apparently, mosquitoes are attracted to invisible Infra-Red light, not the visible light spectrum. Normal light bulbs emit invisible as well as visible light, so IR and UV etc. are emitted as part of the wasted entergy of a normal bulb (even the energy efficient ones, which save energy more on heat). Visible light LEDs do not emit IR, so they do not attract mosquitos (you can, however, get IR or UV LEDs if you want them- most remote controls for TV use IR LEDs). When I travelled, both my head lamp and small torch were LED, mainly because they are smaller and the battery lasted longer. Maybe its time to switch your travel lamp to one made up of LEDs? I have seen lightbulbs here that look like a normal one, but inside have several LEDs instead of a traditional element or flourescent tube. They are also much more difficult to smash, even if they are a lot more expensive (I think they were about Acircpound4, but I suspect this will gradually decrease as the tube-bulbs used to cost this and are now 5p). The LED information is great Ash. Bob I am trying to cover a window today. The hard part was to buy extra net and the tape.